6/3/10 – Restorations, an acquisition and exhibitions – Chantilly, Musée Condé – Since the Foundation for the Château de Chantilly applies most of its funds towards the extensive restorations needed throughout the domain, the Musée Condé pursues its activities thanks to various patrons, foremost of which is the Amis du Musée Condé. The Loggia is located in the middle of the Jean Bullant wing dating from the 16th century. 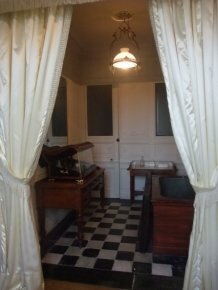 This room (ill. 1) was restored in 2008/2009 for a total cost of 90,000 €. The décor, commissioned by the Duke of Aumale in 1875 is in a neo-Renaissance style. 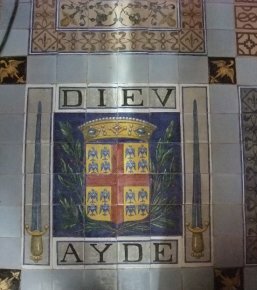 It includes a floor inspired by the Rouen earthenware tiles of Masséot Abaquesne (ill. 2) with the coat of arms of the Connétable de Montmorency, a vaulted ceiling by Jules-Adolphe Delmotte (ill. 3), a student of Léon Bonnat, whose name was found thanks to the discovery of a signature in 1999 as well as wood paneling with enamel inlays covering the walls which evoke the décors of the Ecole de Fontainebleau. The Bathroom of the Duchess of Aumale along with the Salon Violet are part of the small private apartments of the ground floor of the little château. 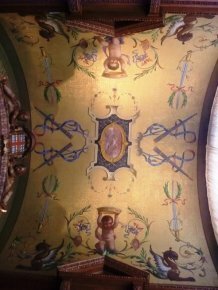 Their décor, restored in 2009, was designed by the painter Eugène Lami. The Bathroom (ill. 4), installed in 1845, presents the Duchess of Aumale’s toilette, an ensemble of 19 silversmith pieces assembled in a 19th century Boulle marquetry case. 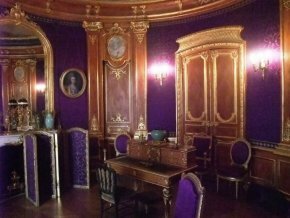 The Salon Violet (ill. 5) was decorated in 1845-1846 in a neo-Louis XVI style. The walls were originally covered in green fabric which was replaced by a violet colour as a sign of mourning after the death of the duchess of Aumale. Due to the light, the colours had faded entirely and the fabric has since been redone . The furniture in the small apartments is mostly the work of the cabinetmaker Guillaume Grohé. Several pieces have also been restored thanks to the Amis du Musée Condé. 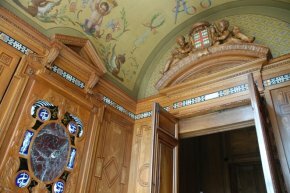 The next step in the restoration process for this apartment will be the Salon Rouge, also known as the Salon of the Duke of Aumale, also decorated by Eugène Lami. The Fondation Lefort-Beaumont, in 2008, donated a small bust portrait of Louis II of Bourbon, Prince of Condé, known as the Grand Condé (ill. 6) painted by Juste d’Egmont. 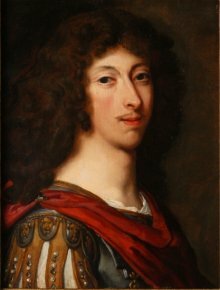 In 2007, the Musée de l’Armée had acquired a portrait by the same artist also representing the Grand Condé, in an identical pose and wearing a similar costume but standing, full-size, in front of the battlefield at Rocroi (see news item of 13/7/09). Chantilly already had two representations of Louis II of Bourbon, half-size, in front of the same battlefield. Alexis Merle du Bourg, curator of the retrospective Anton Van Dyck. Portraits au Musée Jacquemart-André (see article in French), is in charge of the special study exhibition highlighting the Van Dyck paintings held at the Musée Condé, until 29 march. This is an excellent chance to admire at close range canvases which normally hang high up and close together in an arrangement chosen by Duke Aumale himself. The September 2009 issue of Bulletin des Amis du Musée Condé acts as a catalogue for the show. 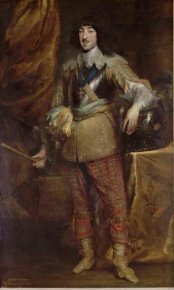 The Portrait of Count Hendrik van der Bergh has been demoted to a workshop piece with the possible participation of the master, while the full and complete original signature on the Portrait of a Lady and the Portrait of Gaston d’Orléans (ill. 7) has been confirmed. Two other paintings (Portrait of Jacqueline van Caestre and Portrait of Duke Wolfgang Wihelm de Pfalz-Neuburg) are fine old copies, as is a drawing representing a Gathering of Angels. Finally, in parallel with the Salon du Dessin which will soon be opening its doors in Paris and the upcoming online posting of the new Dictionnaire des marques de collection which is to be published by the Fondation Custodia  (an edition enriched with the famous Lugt), the Musée Condé is presenting several drawings in its collection which focuses on the collector’s marks. This exhibition (without a catalogue) will continue until 5 April 2010. Let us point out that the glass on the windows is now covered with a film which filters the light in order to protect the fabric. We will soon write a news item on this posting.